There’s nothing better than jetting off on holiday with children; it’s a time to embrace a new culture, get away from the stresses of everyday life and enjoy time as a family. However, one thing that many parents dread is the flight. Flying with children, as most people will know, can be stressful. Keeping young children entertained on any length of flight can be tough and it’s often the time when they decide to act up, run around and cause havoc. But, who can blame them? They’re being made to sit in a confined space with very little in terms of entertainment. If it’s your child’s first time on a plane or the first time on a long haul flight, take the time to prepare them for what’s going to happen. Letting them know what they’ll be doing and what’ll be involved can help them to become a happier traveller. Things such as telling them what will happen at the airport, explaining what’s expected on the plane and giving them a rough outline of the plan can help. No child wants to be bored on a plane and it’s this boredom that can lead to bad behaviour. Prepare for the flight by taking a range of enjoyable activities to keep them entertained. 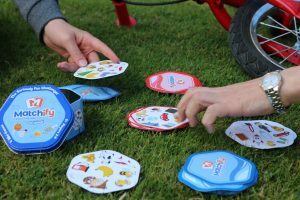 Card games like Matchify are a great choice as they can be played anywhere, as are books and colouring in activities. As a parent the chances are you’re wary of allowing your child too much screen time, but relaxing this on a flight is okay. A child that is engrossed in their favourite film or enjoying an iPad game is unlikely to cause a fuss. Plus, it’ll give you a moment to chill out. Nobody wants to be on a squashed plane in trousers that are too tight, a jumper that’s too warm and anything that’s restrictive. Dressing a child in good travel clothes can help them to relax on a flight and this can avoid tantrums and tears caused by the general feeling of being uncomfortable. Leggings, loose fitting clothing and trainers are always a good choice. Also, layer outfits so you’re never stuck with a child that’s too hot or too cold. Being organised, taking a range of distractions and ensuring they’re comfortable can go a long way to making the flying experience one that is relatively stress-free.